Gil Sharone has just checked in with us, and it seems he's been a busy boy of late. The former Dillinger Escape Plan drummer is back in the saddle with metallers Stolen Babies after a hiatus. A new Stolen Babies album is in the works, and Gil hopes that it will drop around September. He's also been working at Tommy Lee's studio, recording tracks under the watchful eye of Scott Humphrey. Not only that, but Gil is also releasing a new drumming DVD later this year. Wicked Beats is dedicated to Jamaican drumming and will be distributed through Hudson Music. He's also heading out on the road, filling in at the drumstool for hip hop legends De La Soul. Phew! To keep up to date with the many goings on in Gil's professional life, head to www.myspace.com/gilondrums. 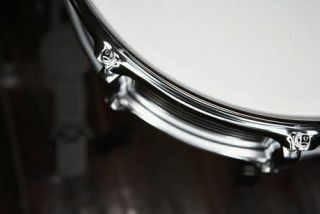 Scott Donnell, DW's Director of Marketing, has spoken out about the drum giant's latest big name additions. After landing the likes of Derek Roddy, Dave Grohl, Thomas Lang and Dom Howard, Scott said: "We really pride ourselves on our Artist Relations program. We have an amazing roster and it's a family atmosphere. It's always been that way and we feel like more than ever, we can offer drummers the best service, products and people in the biz. We're honored to be working with so many talented artists." To check out the many stars on the DW roster, visit www.dwdrums.com. While air guitar is almost recognised as a sport in some quarters, it's drumming equivilent has failed to hit such lofty heights. Until now that is. That's because computer games firm Seven45 Studios has just announced Power Gig, a brand new game that will allow wannabe sticksmen to play along to tunes without the need for a kit. The game uses motion-sensing technology to allow players to drum to pre-programmed tracks, removing the need to clutter up your front room with plastic kits. Bernard Chio, chairman at Seven45 Studios, said:"We know that people may be sceptical of the AirStrike drums at first glance. "But we also know that as soon as people sit down to play it, they are going to see how much more real and authentic it feels to be moving much the same way true drummers do when they play." We're looking forward to seeing just how well this works (even if only for the chance to bust out some exuberant air drumming in our living rooms) when Power Gig is released in October. We reckon it might be right down this guy's street.